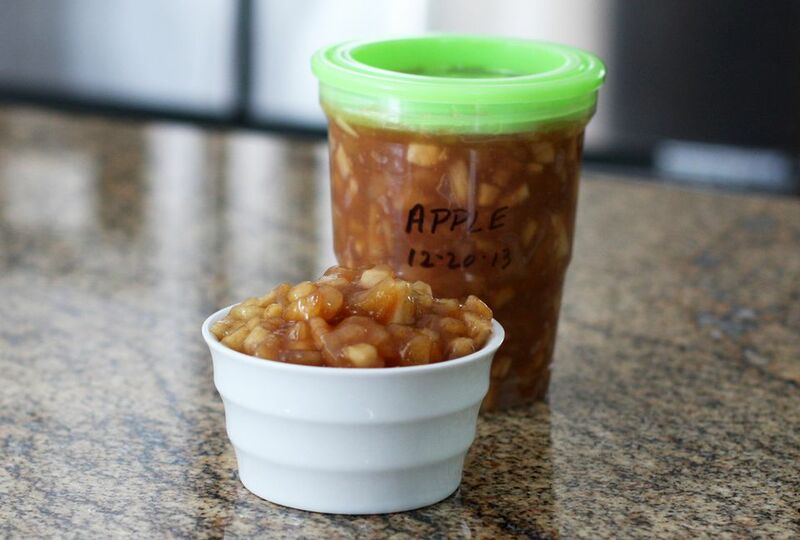 This apple filling makes enough to fill a pie, or use it to fill apple turnovers or hand-held pies, a cobbler, or apple crisp. The filling is easy to prepare and freezes beautifully. You can chop the apples if you plan to use it for hand pies, but you could slice the apples thinly or chop them coarsely for a pie or cobbler. The recipe can easily be doubled or multiplied for more pies. See the tips and variations for freezing instructions and a few other ideas. Peel and core the apples. Dice coarsely or finely or slice them and put them in a large bowl. I chose to dice the apples fairly small because I was making hand-held pies with the filling. Toss the diced or sliced apples with the lemon juice. In a large saucepan over medium heat, combine the sugar and cornstarch; stir to blend. Add the apples, nutmeg, salt, and cinnamon. Bring the mixture to a simmer while stirring constantly. Reduce the heat to low and continue cooking, frequently stirring, for about 20 to 30 minutes, or until apples are tender and the mixture is quite thick. Stir in the vanilla. Let the filling cool for about 30 to 45 minutes. If you will not be using the filling immediately, store it in containers in the refrigerator for up to 2 days or store it for up to 12 months in the freezer (see the freezing instructions below). Use the filling in a pie, in hand-held pies, cobbler, apple crisp, or turnovers. The recipe makes about 4 cups (2 pints) of apple filling. This apple filling can be frozen. Cool the filling for about 45 minutes, then ladle it into freezer containers leaving about 1/2-inch of headspace, or pack it into heavy-duty freezer bags. Seal, label with the name and date and let the filling cool for about an hour. Store it in the freezer for up to 12 months. It will take about 2 1/2 cups of pie filling to replace one 20-ounce can of pie filling. Replace the cinnamon and nutmeg with an apple pie spice blend. Pear Pie Filling: Replace the apples with cored, peeled, and diced or sliced fresh pears.